Natural Star Nani’s upcoming film Nenu Local is directed by Nakkina Trinadh Rao who is fame of Cinema Choopistha Mava starred Raj Tharun and Avika Gor. The film is produced by Dil Raju under his banner Sri Venkateswara Creations. For first time, Rockstar Devi Sri Prasad (DSP) has composed the music for Nani’s film. The film stars Nani and Keerthy Suresh in lead roles while Actor Naveen Chandra playing the antagonist role. Nenu Local comes with Tagline- Attitude is everything ! Nenu local first look poster and teaser have received a good response and increased hype of the film. Makers wrapped up the shooting of the film and running toward post-production activities. Initially, the film is slated to release on December 25th, 2016 and again changed to January 26th, 2017. Now, its is planned to release on February 3rd. Natural star Nani, who is one of the successful actors of Tollywood with consecutive super hits. 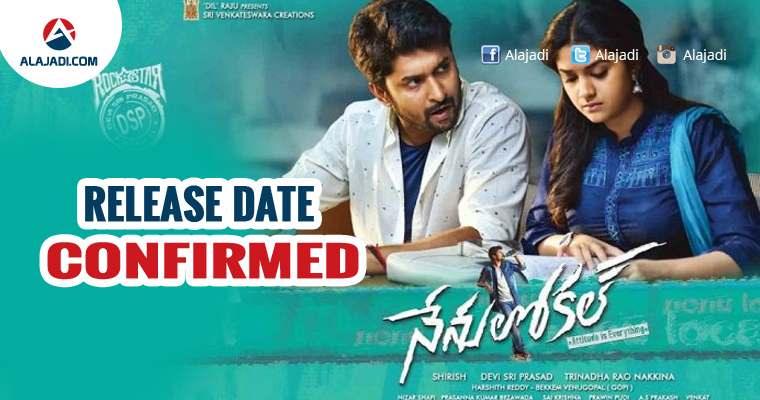 This is the fourth film of Nani this year who earlier seen in Krishna Gaadi Veera Prema Gaadha, Gentlemen and recently released Majnu which are super hit and critically acclaimed by film critics and audience. Now Fans are eagerly waiting for Nenu Local film. It has become an easy practice for Devi Sri Prasad to give hit albums one after the other. One can easily say that the music of Nenu Local is one of the best works of DSP in the recent times. The youthful exuberance that he brings on to his album is infectious as all the songs are full of energy and fun. The film teaser was released and got 9 lakh plus views on YouTube till now. There is no other way for fans than waiting for the movie release. Just wait for some more days to watch it. Let wish good luck to Nani for 2017 year.